Looks can be deceiving, especially when it comes to celestial objects like galaxies and nebulas. These objects are so far away that astronomers cannot see their three-dimensional structure. 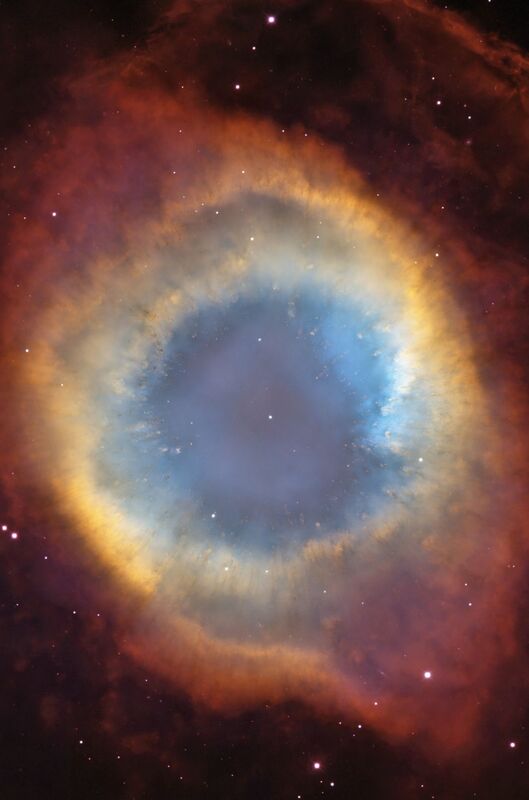 The Helix Nebula, for example, resembles a doughnut in colorful images. Earlier images of this complex object — the gaseous envelope ejected by a dying, sun-like star — did not allow astronomers to precisely interpret its structure. One possible interpretation was that the Helix's form resembled a snake-like coil. Now, a team of astronomers using observations from several observatories, including NASA's Hubble Space Telescope, has established that the Helix's structure is even more perplexing. Their evidence suggests that the Helix consists of two gaseous disks nearly perpendicular to each other. A team of astronomers, led by C. Robert O'Dell of Vanderbilt University in Nashville, Tenn., made its finding using highly detailed images from the Hubble telescope's Advanced Camera for Surveys, pictures from Cerro Tololo Inter-American Observatory in Chile, and measurements from ground-based optical and radio telescopes which show the speed and direction of the outflows of material from the dying star. The Helix, the closest planetary nebula to Earth, is a favorite target of professional and amateur astronomers. Astronomers hope this finding will provide insights on how expelled shells of gas from dying stars like our Sun form the complex shapes called planetary nebulas. The results are published in the November issue of the Astronomical Journal. "Our new observations show that the previous model of the Helix was much too simple," O'Dell said. "About a year ago, we believed the Helix was a bagel shape, filled in the middle. Now we see that this filled bagel is just the inside of the object. A much larger disk, resembling a wide, flat ring, surrounds the filled bagel. This disk is oriented almost perpendicular to the bagel. The larger disk is brighter on one side because it is slamming into interstellar material as the entire nebula moves through space, like a boat plowing through water. The encounter compresses gas, making that region glow brighter. But we still don't understand how you get such a shape. If we could explain how this shape was created, then we could explain the late stages of the most common form of collapsing stars." "To visualize the Helix's geometry," added astronomer Peter McCullough of the Space Telescope Science Institute in Baltimore, Md., and a member of O'Dell's team, "imagine a lens from a pair of glasses that was tipped at an angle to the frame's rim. Well, in the case of the Helix, finding a disk inclined at an angle to a ring would be a surprise. But that is, in fact, what we found." Another surprise is that the dying star has expelled material into two surrounding disks rather than the one thought previously to be present. Each disk has a north-south pole, and material is being ejected along those axes. "We did not anticipate that the Helix has at least two axes of symmetry," O'Dell said. "We thought it had only one. This two-axis model allows us to understand the complex appearance of the nebula." Using the Helix data, the astronomers created a three-dimensional model showing the two disks. These models are important to show the intricate structure within the nebula. The team also produced a composite image of the Helix that combines observations from Hubble's Advanced Camera for Surveys and the 4-meter telescope's mosaic camera at Cerro Tololo. The Helix is so large that the team needed both telescopes to capture a complete view. Hubble observed the Helix's central region; the Cerro Tololo telescope, with its wider field of view, observed the outer region. The team, however, is still not sure how the disks were created, and why they are almost perpendicular to each other. One possible scenario is that the dying star has a close companion star. Space-based X-ray observations provide evidence for the existence of a companion star. One disk may be perpendicular to the dying star's spin axis, while the other may lie in the orbital plane of the two stars. The astronomers also believe the disks formed during two separate epochs of mass loss by the dying star. The inner disk was formed about 6,600 years ago; the outer ring, about 12,000 years ago. The inner disk is expanding slightly faster than the outer disk. Why did the star expel matter at two different episodes, leaving a gap of 6,000 years? Right now, only the Helix Nebula knows the answer, the astronomers said. The sun-like star that sculpted the Helix created a beautiful celestial object. 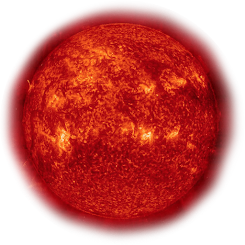 Will the Sun weave such a grand structure when it dies 5 billion years from now? "As a single star, it will create a similar glowing cloud of expelled material, but I wouldn't expect it to have such a complex structure as the Helix," McCullough said. To study the intricate details of these celestial wonders, astronomers must use a range of observatories, including visible-light and radio telescopes. Astronomers also need the sharp eyes of Hubble's Advanced Camera for Surveys. "The Hubble's crisp vision has revealed a whole new realm of planetary nebula structure, which has advanced the field and delighted our eyes," said team member Margaret Meixner of the Space Telescope Science Institute.